“As a lettings platform, we hear many reasons why people want to move property. Our customers tell us they need a larger home for a growing family or, conversely, are looking to downsize as the children have left home. A change of job, new relationship, or financial reasons are also factors in people choosing to up sticks and find a new property. However, something we also hear from buyers is that they are looking to move to sunnier climes.” Alexandra Morris, Managing Director, Makeurmove. Nothing too unusual there, people move to the warm European countries all the time. But, a little more surprising perhaps, is the number of buyers looking to move within the UK to find better weather. So, if are you chasing the sun in this country, where should you be heading for? We've compiled a list of the five sunniest places to live in the UK. For all you weather watches and sun worshipers out there, we have the ideal locations for you. There is more than a hint of controversy when trying to unearth the sunniest place with rival towns throwing their hats into the ring and arguing bitterly about who has the most legitimate claim. This is understandable as there is more than just reflected glory at stake here. The town which is recognised as the sunniest will attract more holidaymakers and new property buyers. The coastal town has been home for an official Met Office weather station since 1897 and the long hours of sunshine which beam down certainly keep the forecasters busy. Bognor enjoys an average of 1921 hours of sunshine every year. Bognor, in fact, holds the yearly record for sunshine with 2237 hours recorded in 1990. 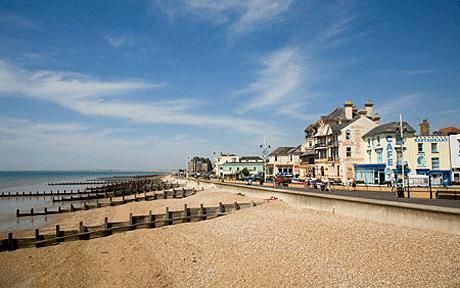 Runner-up is nearby Eastbourne, which is good news for the many retirees who have already moved to the genteel town. Eastbourne is always in the upper echelons of the sunny table and is holder of the 'sunniest month ever recorded' award with 383.9 hours of sunshine logged in July, 1911. The third in the Sussex trio of hotspots, Hastings is only 20 miles from Eastbourne and the two neighbours have a bitter rivalry which is played out in the press and online over which community enjoys the most sun. Even though it is third in our list the site of the most famous battle on British soil is still a ray of sunshine to its happy residents. 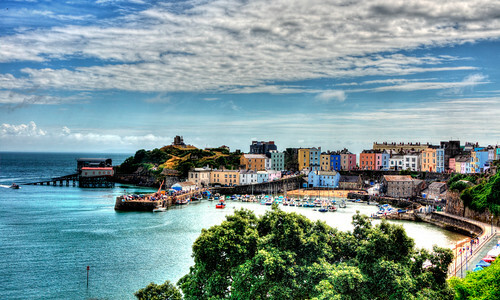 Moving northwards and in third place is Tenby in beautiful Pembrokeshire, South Wales. There are no big areas of population in Pembrokeshire, in fact, St David's City, with a population of just 1400, is the UK's smallest city. But there are some wonderful towns and villages in which to find a new home. As well as Tenby check out Newport, and Narberth, whose properties are always sought after. Bristol has undergone staggering growth both culturally and economically in recent years and the city is a vibrant and exciting place to live. With plenty of sunshine as well the city should appeal to many looking for a new home in the west country. We've restricted our sunshine league table to the mainland UK and have admittedly been selective in the towns we have looked at. But offshore the Channel Islands, naturally enough, enjoy more sun than most with Guernsey weighing in with a massive 1863 hours of sunshine. At the other end of the scale in Scotland, which has shorter winter days and long summer days, the sunniest place to live is usually claimed by Glasgow. But, figures suggest Dundee has the edge. Scotland's fourth largest city enjoys around 1426 hours of sunshine compared to 1203 in Glasgow. Property Search - take a look now to find your property.